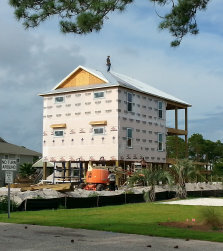 Alicia is building a new waterfront home in Orange Beach, Alabama, just a few miles from where I live. She contacted me about building 2 transoms with a nautical theme for her new home. Being only a few miles away, I was lucky enough to be able to meet Alicia personally, take some measurements, swap ideas about her project and go over glass samples. This was a wonderful opportunity because it is rare that I ever get a chance to actually meet most of the folks I build glass for. Because Alicia's Transoms are under construction! Alicia introduced me to "Larry", a great blue heron who frequents her deck overlooking the water. These herons are native to our area and are commonly found here anywhere people are fishing or where they can find a free meal or a few table scraps! Since he is almost one of the family, Alicia wanted to feature "Larry" prominently in our designs. 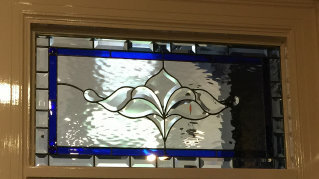 Alicia wanted both transoms to have beveled borders with bright & bold stained glass colors to give that "every day at the beach is a great day" feeling!